I hate that I’m one of those people that gets annoyed by so many things… The sound of people clipping their nails. The fact that it’s socially unacceptable for me to let my leg hair grow out. When I’m singing along with a song in the car and the artist gets it all wrong. That I can’t live a healthy life just on cupcakes. I could go on all day. One of the things that annoys me the most: when someone invents something that’s stupid as hell and becomes a millionaire. How many people face-palmed when ‘silly bandz’ became popular a few years ago? Hell, I did. 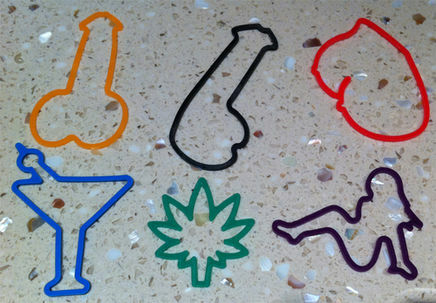 Rubber bands in different shapes. That’s all they were. Yet, kids walked around for a solid year with them stacked all the way up to their armpits. There were hoards of them. Foaming at the mouth, begging and pleading their parents for them in every store I went into. For rubber bands. Rubber bands, people. The things that come free wrapped around your celery. Don’t even get me started on pet rocks. What the hell is with that? I can’t tell you how many times stupid inventions have come around and it makes me question my intelligence. WHY DIDN’T I THINK OF THAT? BLAIR, YOU DUMBASS. Just think — we are all one stupid idea away of becoming millionaires and living the rest of our lives doing nothing but eat cake and be lazy. The true American dream. I’m so out of touch. I’ve never even heard of Silly Bandz. YES! I’m so with you on this! I’ve even asked around at work for others’ stupid ideas in hopes I could capitalize off of their ignorance. But nothing ever seems right. And those silly bandz things made me so angry! For free on celery!! You’ve cracked me up…as usual!! I hope you have more luck than I’ve had – the people I ask are either so stupid, they’ve stopped speaking and only drool and grunt, or else they’re keeping the best ideas close to the vest (bib?). “When I’m singing along in the car and the artist gets it all wrong”–YES. My versions are always better. If it makes you feel any better, I shave my legs too… and my wife digs it. My husband always comes up with brilliant ideas but never follows through. I tell him he could make a fortune! Thanks for the laugh. Hey, by the way, those bandz are free on asparagus as well in Australia – and they’re purple! Another thing I get annoyed at – this morning I was overcharged nearly ten dollars (again) at my local supermarket! Aaaagh! I always check my receipts now cos it’s happened way too often. Have even told the Manager they need to retrain their staff!! He agreed, but it still happens. Go figure! Good for you. Watch out for my next post! You can live a healthy life just on cupcakes but you’d have to get very creative with the items you put into that cupcake tin. And now kids just want to play with rubber bands? Crazy! Chia pets! I forgot about those things lol. You probably did think of it first — you are the plant girl, after all. The rubber bands were like 4-5 years ago. The fad ended. Thankfully. Haha I forgot about those! Or my personal favorite: clap on, clap off…the clapper! I can’t help but think of the cranky old woman from the commercial. Call in the next 5 min, and your shipping is free! But wait, there’s more! So true… and such a great example of why money does not equate to value. You might appreciate this Japanese word: “Chindogu.” It’s basically the art of inventing gadgets and things that solve a problem you didn’t know you had until you found out the gadget existed, and thus you suddenly must have whatever random crappy thing it is. There are entire stores dedicated to this stuff in Japan… and you could get lost in there for hours! My very own desk is home to an “Easy” red button pushie thingie from Staples that took the key word of their tagline (easy), “That was easy!” put it in lower-case white letters on the button, and put in a male voice saying the tagline. Press the button, get the reassuring comfort of, “That was easy!” WHO would want one of these? Apparently, zillions of people. Apparently, I’m one of them. Pausing from my self-disgust to figure out why I bought this, which, on the face of it, is a “stupid” idea, I realized a lot of people (not to say myself, of course…) operate amid many insecurities and fears, and the tyranny of a long to-do list. So when one has faced the fear or checked off the chore, it’s such a nice “button” to the event to smack the red Staples button and hear that hey, it wasn’t so bad after all, and we’re officially done! Who knew we needed that? Staples, apparently. Haha, we used to have one of those buttons where I used to work. Any time someone did something stupid, and our boss had to fix it, she would push it as they walked out the door. It was pretty funny, actually. Staples was on the ball with that idea. lol. Blair, you dumbazz… it’s poor people who lay around all day and eat cake. Rich people are busy playing golf and managing their money and buying small islands in the shapes of their favorite silly bands. Haha. Very true, very true. Haha true! Thanks for following my blog Blair ! I felt a similar way about loom bands! Haha that sounds pretty yummy, though! Hahaha I love this. I want that dream Blair!! Now just to think of something stupid…. I don’t think Silly Bandz have made it across the pond, but reading about them – animal shaped rubber bands – I can see why the concept works given they’re collectable and wearable. We had Loom Bands here. Luckily they were after my time but I did find myself in a situation of having to make them a couple of months ago and once I figured it out I found it surprisingly calming. At least they involve a bit of manual dexterity and memorising patterns. I actually think Loom Bands are kinda cool, lol. I agree, there’s more to them than just buying them. I’m all about crafty things. I’ve made a few with my nieces and I actually enjoyed doing it. Hahah what? Pet rocks? Are you kidding me? I swear sometimes I think the world is crazy. I think they came out in the 80s — so it was quite awhile ago lol. It was literally a rock in a box and sold as a “maintenance free pet” He made something like 15 million in the first 6 months. Crazy…right? Being a very young child in the late 70s, I can safely guesstimate they were at their height in 78 or 1979 –I’m THAT OLD! Hahah. Did you have a pet rock? I probably would have bought into the hype if I was a kid then. My neighbour did and I was jealous! Haha that’s a good one, too. Such a simple idea!